The Colorado River originates high in the Rocky Mountains, less than 50 miles away from our most popular launch site on the Upper Colorado River. 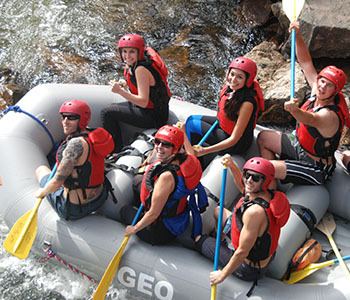 Geo Tours has a variety of raft trips along a continuous 58 miles of the Upper Colorado River as it cuts through the Gore Mountain Range on its way to the Pacific Ocean. 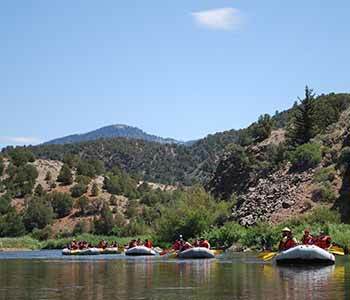 There are rapids in the narrow canyons and calmer waters in the intervening valleys, in addition, the Upper Colorado boasts hot springs, historic cabins and incredible scenery. Therefore, it is ideal for first-time participants, families and groups of all ages and abilities. The Upper Colorado is near resort towns such as: Breckenridge, Steamboat Springs, Vail and Winter Park and pickups can often be arranged at many mountain locations. Likewise, guests can also choose transportation from Denver with Geo Tours. In short, let us do the driving! Geo offers one-day, overnight, two-day, three-day, four-day and five-day raft expeditions but you may want to try out our Inflatable Kayaks (IK’s) to add that “up close and personal touch” to your adventure. Take advantage of Geo’s experience and expertise and let us plan the perfect trip on the Upper Colorado river for your group. 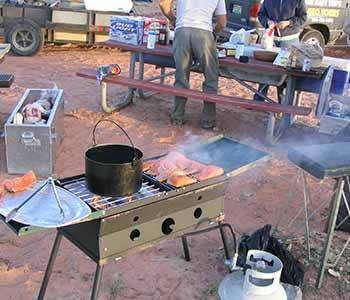 Prices include: all meals, rafting equipment, spray jackets and of course, guides. In addition, Geo Tours has camping gear and wetsuits available for rent. Call for more information. Geo accepts VISA, MASTERCARD, DISCOVER. All prices subject to change without notice. *Minimum age requirements may vary with water flows and conditions. This trip begins at the Pumphouse and continues downstream through Little Gore and Red Gore canyons. A great mixture of moderate rapids, such as: Needles Eye and Yarmony and gentle water. Other sections further downstream can be rafted as a one-day trip, these trips offer less congestion than the Pumphouse run. 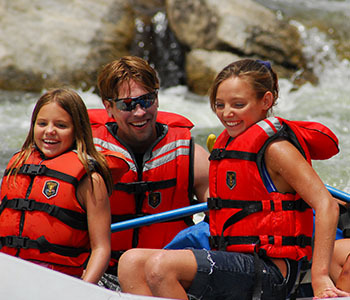 With a minimum of two rafts, Geo can customize a part-day trip for your group. Call for rates. * Minimum age requirements may vary with water flows and conditions. An overnight trip is, typically, a 1/2 day on the river with a riverside camp that night followed by a 1/2 day rafting on the final day. Trips launch in the afternoon and finish up the following day. Geo’s trips are fully self-supported which means we have everything we need to have a well appointed, while relatively remote campsite along the river. Don’t forget that Geo Tours has inflatable Kayaks (IK’s) that are a great way to explore the river on Overnight trips. Geo has multi-day trips 2 to 5 days in length. 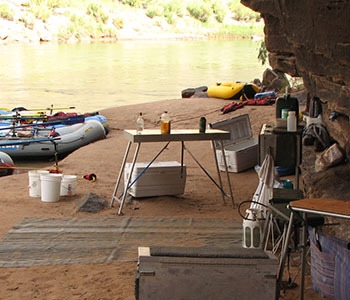 These trips give you the opportunity to explore some of the “less traveled” sections of the Colorado River. You’ll enjoy beautiful scenery, spectacular canyons, wildlife sightings and lessons in natural history, environmental stewartship and a little geology. Multi-day trips let you “get away from it all” in the midst of some of the finest scenery in this portion of Colorado. Let us customize one of these trips for you! All overnight trips include: meals, rafting equipment, inflatable kayaks (upon request), spray jackets and of course, guides. Geo Tours has camping gear and wetsuits available for rent. Travel from the Denver Area is available at additional cost.